2016-2017 Holiday Specials - Great Offers! 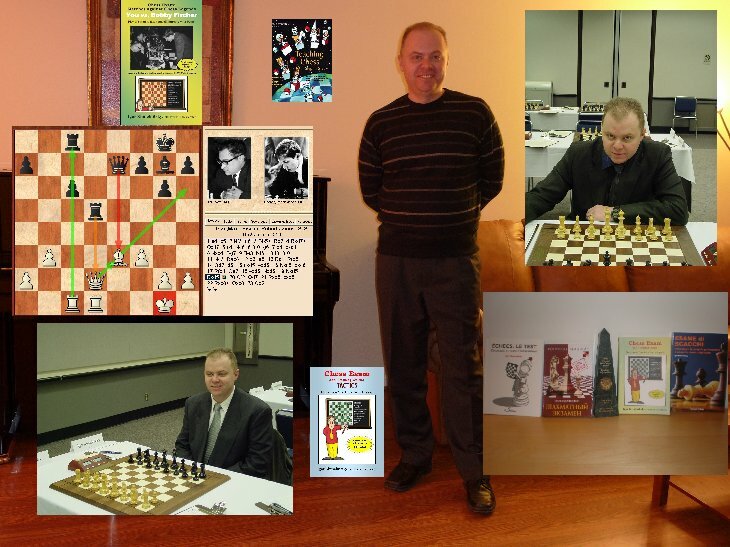 Igor Khmelnitsky, International chess master, award-winning and best-selling author, experienced chess coach. Are you interested in helping me in my future projects? I am looking for testers and proofreaders. Please contact me here. 2/08: another great review of my Chess Exam and Training Guide Tactics. 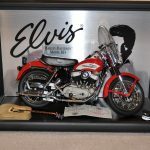 This one is by Michael Jeffreys for Chessville.com. "... The thing that makes his books so good, as I mentioned above, is his eye for great material. All of the positions he selects are interesting and usually the obvious try is not the best. Also, he mixes up his problems so that each turn of the page brings a new adventure, i.e. they are not in any type of “thematic order” like most puzzle books." Read the entire review here. View a YouTube video clip here. 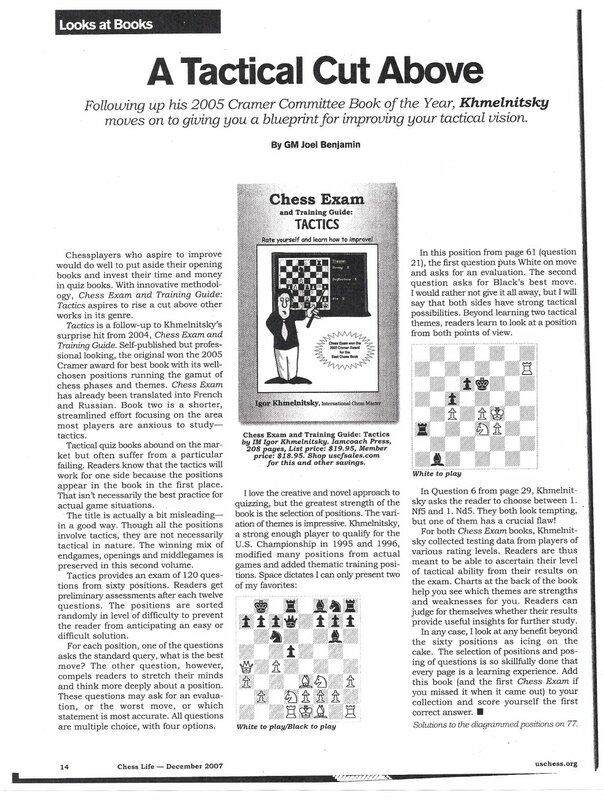 Review by former US Champion GM Joel Benjamin in December '07 Chess Life and US Chess Online - "...With innovative methodology Chess Exam and Training Guide: Tactics, aspires to rise a cut above other books in this genre...I love the creative and novel approach to quizzing, but the greatest strength of the book is the selection of positions. The variations of themes is impressive... The selections of positions and posing of questions is skillfully done that every page is a learning experience..." Read the entire review here. Would you like to know how good is your chess? Whether you are a beginner player or a weathered master, these books will help you evaluate your current level, identify your weaknesses and offer training advice. Chess Exam #3 - You vs. Fischer - click here. Comprehensive answers includes diagrams for easy reading away from the chessboard. Distributions of answers, percentiles and other statistical reports by rating group from unrated to 2400+. Match yourself against players of all levels, up to grandmaster and see how you stock up. 60 diagrams & 120 total questions of various difficulty. 2. Interested to Learn More? (Click Here) Additional details, Reviews, Feedback, Examples, Sample pages. You can pay with credit card or send check / money order. Check Out various Additional Tools and Training Materials: graphs & charts, ChessBase training files and a lot more! You submit your answers and after a detailed review we have a 1-on-1 phone session to discuss my findings and answer your questions. 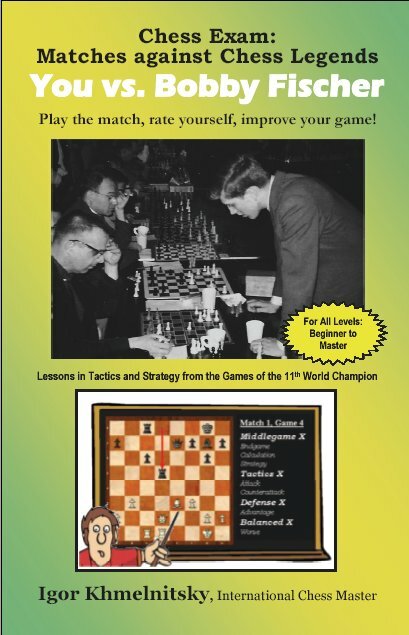 Chess Dealers, Chess Clubs, Webmasters, Tournament Organizers, Coaches - join ChessCafe, Wholesale Chess, Chess House, Marchand and other reputable dealers offering this book to their customers. Have any additional questions or requests? (05/23/2008) Italian edition of the original Chess Exam (2004) was just released by Le due Torri, the leading publishing house (Italy). For publishers - please note - The rights are available for other languages! Contact me directly. 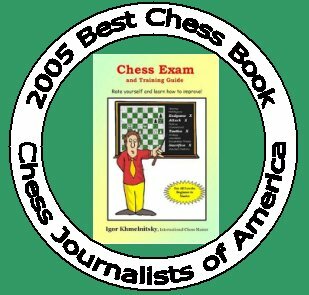 (03/01/2007) Russian edition of the original Chess Exam (2004) was just released by Ripol, the leading publishing house (Russia). The same company that publishes Kasparov's books in Russian. 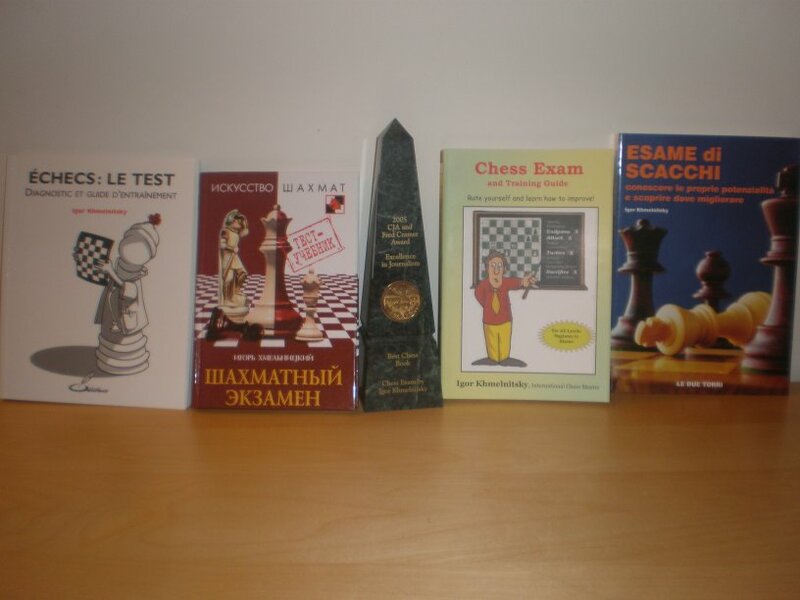 (9/18/06) The first Non-English translation of the Chess Exam was just released by Olibiris publishing house (France). It looks very sharp! If you read French and own the copy, please let me know what you think. The Russian edition is in the works!